Yesterday Google launched a mobile web version of their Beta Tasks web application. 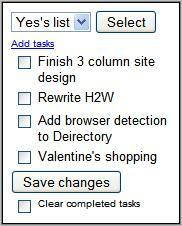 Tasks is a Google Labs product currently. Before you can use it on your phone you have to first go into the “standard” (not basic HTML) desktop version of gMail, click on “Settings” and then on the “Labs” tab and enable Tasks. “The page – www.google.com/tasks – does not exist”. There are two versions of mobile tasks. iPhones and Android devices get an enhanced one that lets you add, edit, and delete tasks and task lists, as well as mark tasks as completed. Lesser phones see a stripped down Task interface which is missing the ability to edit or delete tasks although you can view your existing tasks, add new tasks, and mark tasks as completed. This entry was posted in Personal Information Management and tagged Gmail, mobile site review by Dennis Bournique. Bookmark the permalink. Thanks for the mail.google.com/tasks/m tip…that’s just what I was looking for!